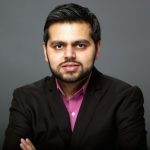 Prof. Azhar teaches the capstone course in the CUNY SPS Master's of Data Science program. A former data scientist at Facebook, he is currently the chief data scientist at the blockchain startup Zap.org and the founder of PRISMOJI. Weichman, K.E., Tanna, N., Broer, P.N., Wilson, S., Azhar, H., Karp, N.S., Choi, M., Ahn, C.Y., Levine, J.P., Allen, R.J. (2014). Microsurgical Breast Reconstruction in Thin Patients: The Impact of Low Body Mass Indices. Journal of Reconstructive Microsurgery. Peciña, M., Azhar, H., Love, T.M., Lu, T.T., Fredrickson, B.L., Stohler, C.S., Zubieta, J.K. (2013). Personality Trait Predictors of Placebo Analgesia and Neurobiological Correlates. Neuropsychopharmacology, 38(4):639-646. Tanna, N., Im, D.D., Azhar, H., Roostaeian, J., Lesavoy, M.A., Bradley, J.P., Jarrahy, R. (2011). Inferior turbinoplasty during cosmetic rhinoplasty: Techniques and Trends. Plastic and Reconstructive Surgery, 128(4S):63. Tanna, N., Patel, N.J., Azhar, H., & Granzow, J.W. (2010). Professional Perceptions of Plastic and Reconstructive Surgery: What Primary Care Physicians Think. Plastic and Reconstructive Surgery, 126(2):643-650.